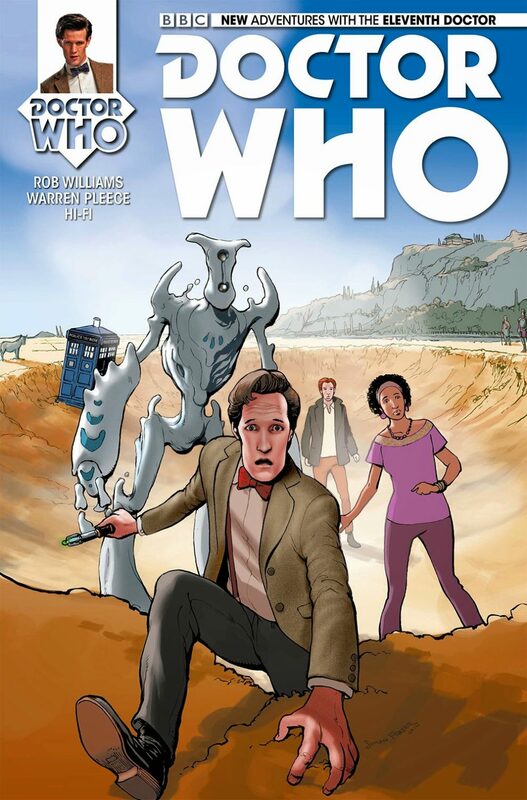 Al Ewing and Rob Williams were in charge of Titan Comics’ Eleventh Doctor title launched in July 2014, and while the former has since left the series to work on titles for Marvel Comics, Williams remains at the helm of the Eleventh Doctor comics, joined by 2000AD‘s Si Spurrier. I spoke to Al and Rob near the end of the “Year One” of the series. DWC: Do you feel there is less freedom writing for a licenced title as opposed to your work on 2000AD and elsewhere or does the constraints of the format actually allow greater freedom? Al: Freedom really hasn’t been an issue. As ever, when doing a licensed work, you’re never entirely sure what to expect, but the BBC Who office have been enormously accommodating with our suggestions. There were a couple of things we were told to avoid, and one or two things along the way that we’ve suggested that were nixed because we were told similar ideas were at play in the upcoming scripts for the TV show. But that’s been far and few between. Any time you do work for hire you have an editorial understanding that you may not be able to do everything you want to do because it doesn’t fit with current plans for that universe. That’s understood going in. But I’ve genuinely been surprised and pleased with the freedom the Beeb’s Who office have allowed us. Rob: Agreed. I haven’t felt any difference between working on Doctor Who and working on, say, Judge Dredd. There are things we probably can’t do, but they’re things we wouldn’t think of doing anyway, because they’re not Doctor Who stories. And within the framework of writing a Doctor Who story, we’ve had pretty much total freedom. I’ve been absolutely astonished at some of the things the BBC have allowed us to get away with in this comic, and I’m very grateful for their light touch. 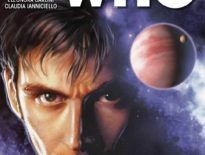 DWC: Where do you start from when creating a new companion? How do you make her sufficiently different, yet interesting? Al: I guess it’s just trying to offer something that hasn’t been explored elsewhere. That’s very tough to do with 50 years of Doctor Who history, and it’s up to others to judge whether we’ve succeeded. But with Alice [Obiefune], the thinking was to give the Doctor a female companion who, physically and emotionally, is more mature than his usual TV companions. 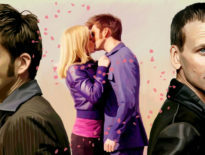 The clash with Matt Smith’s youthful appearance and having a female companion in her late 30s who’s “too old for a flatshare” and is dealing with personal grief when she comes on-board – that felt different from the likes of Clara and Amy. Then Jones is basically David Bowie. The idea there was “where did all Bowie’s regenerations come from?” and so pairing him with the Doctor seemed a fun explanation of that. ARC, our third companion, is alien and a shape-shifter, and that’s the type of thing they couldn’t do on the TV show regularly because of budget. But in comics we can do such things. All three have been a lot of fun to write. ARC essentially came from wanting a non-human companion – someone who wouldn’t think in human terms, who we wouldn’t be able to understand. He ended up just a little bit too cute to be entirely unknowable, but most of the original idea came through: the monster who becomes a companion when the Doctor chooses understanding over aggression. Which isn’t to say he’s entirely safe and cuddly – as [we saw] in #11, there are times when he can get a little scary. DWC: Which is best, creating a new companion, or a new enemy? Al: For me, probably a companion, because we’ve spent so much time with them in this series that you’ve got to know them. They become nuanced and get more fully formed as you go. The new enemy tends to pop in with an evil plan, say ‘DOC-TOR!’ and hop off again. It’s more a quick burst of nasty old fun. A one night stand or a long term relationship. There’s plusses to both. Rob: New enemies can be a lot of fun – the Amstrons were an example of us getting to build things up a little. I’m not sure if people noticed all the references to the Amstrons and the Wheel Wars, but hopefully at least a couple of people were happy to see the Amstrons finally turn up – and when they opened their armour to reveal the tiny space rodents within. I’d like to see them make a return – we’ll have to see if they’ve got what it takes to become monster regulars. Maybe in the future there’ll be an opportunity to see the Wheel Wars up close and personal! 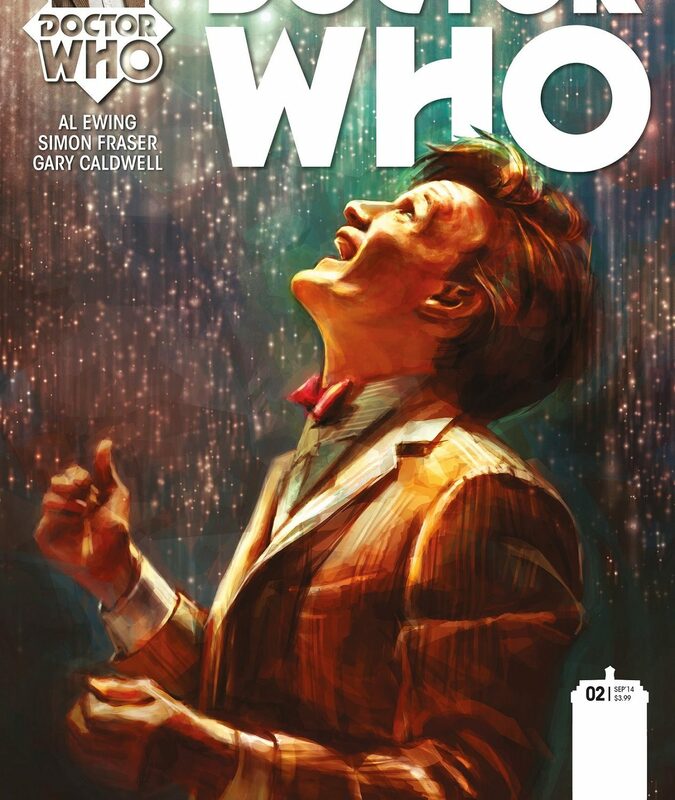 DWC: How has focussing on the Eleventh Doctor changed your attitude towards him? Is there anything you would like to do with him but can’t due to the licence? Al: I’m not sure it has changed my attitude to the Eleventh. I liked him a lot beforehand and possibly like him even more now, having tried to get into his head this series. I think he tries to do the right thing but is fallible – he hasn’t always got things right in our series, and he’s paid a price for that. I guess that’s the fine line you tread writing one of the smartest men in the universe. You can’t always have him pull the trump card and say “a-ha, but I’m the Doctor and I thought of THIS!” and shazam, he’s free. There are times in our stories where he’s needed others to save him. He’s been tempted down a bad path, and that’s fascinating – the idea of the Doctor with his time machine turned to the dark side. I guess that’d be a fun thing to explore more, were we to have total freedom. But then you risk losing the heart of the show. I guess that’s your job as a writer, to push the boundaries as much as you’re able, but retain the tone and feel. I think we’ve done that. Rob: Anything you could do with Doctor Who that wouldn’t fit in a Doctor Who story… wouldn’t be a Doctor Who story. And within the license, there’s an awful lot we’ve been able to do. 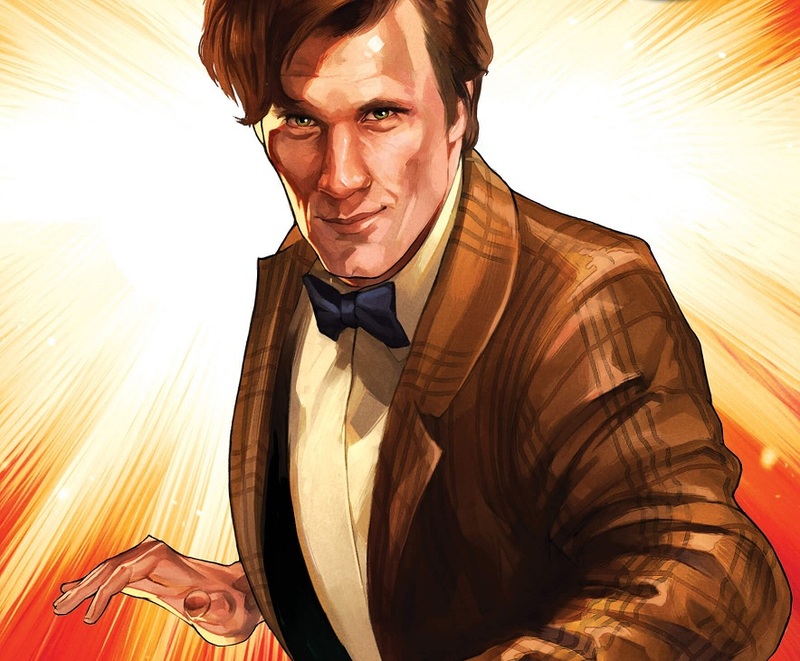 As for how my opinion of the Eleventh Doctor’s changed – I can’t say it has, to be honest. I’ve got a little more respect for Matt Smith’s delivery, though – trying to write dialogue in the Doctor’s “voice” has given me a new appreciation of some of the subtleties of his performance. It’ll be interesting to go back and watch some episodes now that I’ve played around in that world a little. Thank you, Al and Rob!